Nyssa will die at dawn, and the Doctor doesn’t even know why. When even that fails, the Doctor has a choice — let Nyssa die, or make a deal with the devil. Peter Davison is the Doctor in Primeval. For the most part, Big Finish has done their best to keep the audio plays separate from the original TV series, choosing not to intertwine the two together. Listeners have been gifted with small doses of TV continuity, consisting of one or two lines, such as Nyssa referencing the death of Adric in The Land of the Dead, Ace mentioning a previous run in with Nazis in Colditz, or the Sixth Doctor freaking about vampires in Project: Twilight. While it is possible, if a fan is dedicated and insane enough, to put together a continuity weaving the television serials and audio plays together, Big Finish has focused on producing plays that can be enjoyed by a listener who has very little knowledge of old-school Who, slowly easing them into a much wider world should the listener choose to explore it. Of course, if one is already a dedicated Whovian, then they’ve already dived into the deep end and found out that the water is just fine. Primeval is a unique creature. It’s an audio play that attempts to stand on its own two feet even while tying itself in to two popular and influential television episodes: The Keeper of Traken and Logopolis. Not only did these episodes lead to the end of Tom Baker’s run as the Fourth Doctor, they introduced us to Nyssa, who would serve as a stalwart companion for a good part of Peter Davison’s tenure as the Doctor. A bit of necessary backstory. An academic aristocrat, Nyssa hails from the planet of Traken, the capital of the Traken Union. A federation where peace was prevalent, so much so that evil was said to have died out entirely, Traken was protected by a bioelectrical engine that provided unlimited energy and protection from outside forces. This engine, called the Source, was overseen by a caretaker called the Keeper who used its power to maintain the safety and prosperity of the Traken Union. Sadly, the Union was destroyed by a wave of entropy, leaving Nyssa as the planet’s last survivor. The stress of being the last Traken caused Nyssa to collapse at the end of the Fifth Doctor serial Four to Doomsday as well. There will be two types of listeners when it comes to Primeval. There will be those listeners who will be a little lost at first, until the world-building via Lance Parkin’s script will fill them in and let them treat this story as a “historical tale of a time that never existed.” And there will be those listeners who are familiar with or quickly become reacquainted with Nyssa and Traken and get swept up in the story. For either group of listeners, Primeval is a solid, well-written tale about gods, science, good, and evil, although those familiar with the TV series will get more out of it than first-time visitors. The story begins with the Doctor frantically pounding on the door of a healer. Nyssa is passed out in his arms, close to death. The healer does what she can to stabilize Nyssa, but in the process, attracts the attentions of the planet’s Consul, who are very interested in the newest visitors to their planet. For their planet is Traken, 3000 years before its destruction, and the only location in time and space where the Doctor could find someone who knew Traken physiology. As a weakened Nyssa comes to grips with the fact that she’s in her destroyed planet’s past, the Doctor must come to terms with Nyssa’s mortality; no one on Traken can help her. Not even the Source, the all knowing, all powerful engine. Instead, the Doctor must look outward, to a malevolent entity that haunts the very edge of the Traken Union and promises the Doctor that he and only he alone can save Nyssa, for a price. The play, even though it begins in media res, takes an episode to finds its footing. The first episode is primarily exposition, either introducing listeners to Traken or refreshing their memories about the bountiful and peaceful planet and the main locations of the story; the Consul Chambers, the Grove, and the Source. The main players are introduced as well. Shayla, the healer and her assistant Sabian. Janneus and Hyrca, the Consul members who consult and venerate the Source for the protection it provides. Narthex and Anona, dedicated soldiers and servants to the dark god that waits for the Doctor; Kwundaar, who knows all, sees all, and provides all. As the Consul debates the fate of Nyssa, a Trakenite who has been exposed to evil thanks to her travels with the Doctor, the Doctor flies out to the edge of Traken space to meet with Kwundaar. The script is very brisk and very well done. Exposition is gently handled instead of being shoved down the listener’s throats. Instead of working with information overload, the script by Lance Parkin provides only what is needed to set the scene and allow the listener to draw their own conclusions. The origins, actions and master plan of Kwundaar is a perfect example as revealed over the third and fourth episodes, and the climax between the Doctor and Kwundaar, a mental battle of wills, manages to come across as gripping without being over-the-top. Sadly, the one drawback in the script comes with the very end of the audio; Primeval is a prequel to The Keeper of Traken in some ways, but the connection is made in a “throw it in there” manner, and the consequences of the Doctor being responsible for the connection BEFORE it happens LATER in his own timeline are barely mentioned. It’s a wasted opportunity that, if executed properly, could have added some great drama to Nyssa and the Doctor’s visit. The script also allows for development of the characters without one of them stealing the spotlight. For example, Narthex, the leader of Kwundaar’s soldiers played by Billy Miller, is portrayed in one scene as a tough-as-nails military leader who brooks no weakness from those under him, and in another scene as a man who’s doing his best to raise and care for his family from a vast galactic distance. Each character gets these moments, little pieces of conversation that make the supporting cast stand out. Aside from Narthex, we have Romy Tennant as the blindly and fiercly loyal Anona who praises Kwundaar in all things, Susan Penhaligon as the healer Shayla who is determined to heal Nyssa even as she is fascinted by the Doctor, and Rita Davies and Alistair Lock as the Trekan Consulars who, for those without religious trapping, praise and hail the Source until it fails them. Lock’s character in particular has a great mental breakdown in the fourth episode that has to be heard. Stephen Greif is easily the standout among the supporting cast. With great voice modulation and a confident attitude, the self-proclaimed god Kwundaar manages to make even the Doctor scream in agony when he breaks into the Time Lord’s mind. Even as the air of mystery hangs around him, it doesn’t take long for Kwundaar to establish himself as a memorable villain in the Big Finish pantheon, from his introduction all the way to his final fate. Even though this is Nyssa’s story, Peter Davison turns in a great performance as the Doctor. What lengths would the Doctor go to save a companion? 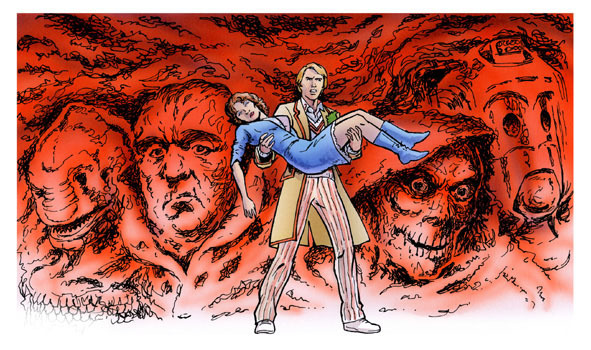 We know what the Fifth Doctor does to save Peri’s life at the cost of his own, so it’s no surprise the lengths he goes to in an attempt to help Nyssa, even going to far as to make a deal with Kwundaar. Of course, the Doctor is counting on his superior intellect to get him out of trouble, but this is the Fifth Doctor we’re talking about. Trouble, death, and destruction seem to find him on a weekly basis it seems, no matter how often he does everything he can to save everyone. 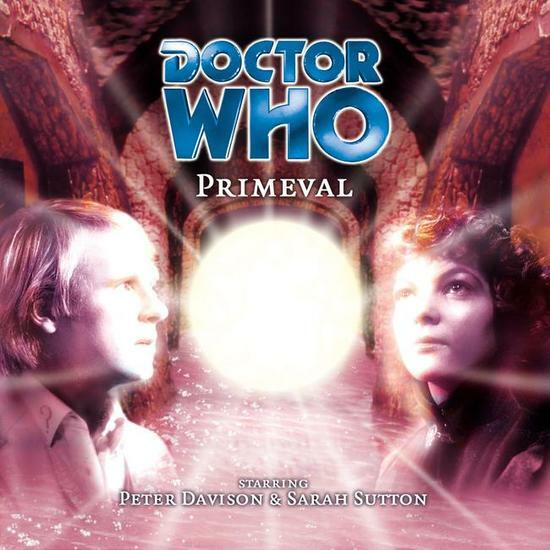 Davison plays up the depseration of the Doctor’s savior complex from the very beginning and doesn’t let up until the very end of Primeval. But this serial belongs to Nyssa. This serial ties up the “psychic capabilities/fainting” threads prevelent in Four to Doomsday, Time-Flight, and the audio Winter for the Adept. Sarah Sutton could have played the simple “woe is me” female, but instead, we get a Nyssa who tells an opponent who she’s gotten the drop on to tell her which is the stun setting on the laser rifle, or else she might accidentally use the kill setting. Nyssa initially realizes where she is and just how careful she should be, and it’s a quiet longing that Sutton utilizes in her voice and actions for the first two episodes as she faces up to what she’s lost in her past with Traken’s destruction. She develops into a strong character in the second half of Primeval as she sort-of-recovers from her malady, carefully developing a friendship with Sabian with a nice scene where she teaches him the Charleston. While Nyssa didn’t need “saving” in the way with Sixth Doctor or Mel Bush did, the Big Finish audios have done a great job building up her character, and Primeval is the payoff. By the end, Nyssa has become what Peter Davison had been saying for years; the perfect companion for the Fifth Doctor. Synopsis – Only Doctor Who could have an adventure that serves as both a sequel AND a prequel to a previous episode. Well-written and well-acted, this is one for not only fans of Nyssa, but fans of the old series who will appreciate the callbacks to an influential storylime. But newcomers to “Who” should definitely not overlook this audio either. 4/5. Next up – Who is the mysterious, curly-haired stranger who insists on causing trouble? What role does the feisty redhead Melanie play in his scheme? And what have they to do with the sinister alien cylinder approaching Generios? Colin Baker is the Doctor…or is he?? ?…in…The One Doctor. This entry was posted in Big Finish Review and tagged Big Finish, Doctor Who, Fifth Doctor, Nyssa, Peter Davison, TARDIS. Bookmark the permalink.